The giandujoso tube is an original take by Leone offered to chocolate lovers everywhere: this is a highly unusual presentation of a product offering all the softness of the giandujotto and the smooth texture of a cream. 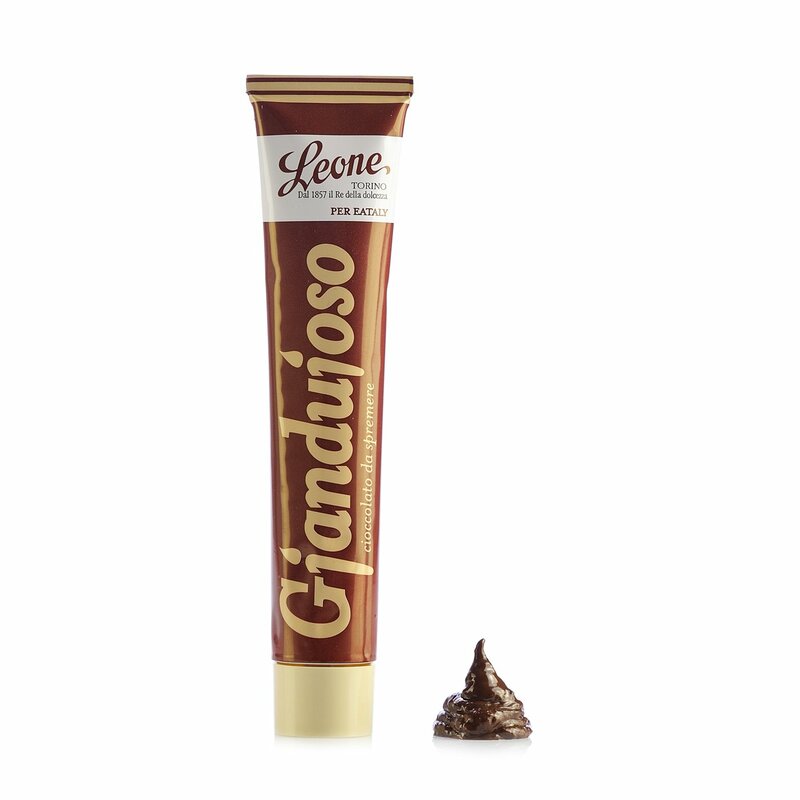 The tube contains a soft gianduja cream made with only the finest ingredients: prized Venezuelan cocoa varieties meet with Tonda Gentile delle Langhe hazelnuts, recognised all over the world with the IGP protection mark. The distinctive fragrance comes from the use of natural vanilla pods. This cream offers all the sensory properties to meet the expectations of true chocolate connoisseurs: try if on bread or melba slices for breakfast or take advantage of the special pack for toppings, fillings and decoration of cakes and biscuits; of course you can always just pop it in your pocket for a tasty snack while you're away from home! Ingredients “Piedmont hazelnuts IGP” (45%), sugar, cocoa, cocoa paste, vanilla pods. Emulsifier: soya lecithin (no-GM). ALLERGENS: Soya and soya-based products, milk and milk-based products, including lactose, nuts and derived products For more information on product labels, please contact our Customer Service department. The information on the labels of the products may vary for reasons beyond our control, therefore, there may be discrepancies between the information on the site and that on the products delivered. Please always check the information on the product before consumption or use. Still to this day in Piedmont a kind and popular person may be described as 'Marca Leun' in reference to the famous lion brand: Pastiglie Leone is something of an institution, with a history dating back more than a century and a half since the company was founded in 1857 in Turin under the rule of the House of Savoy. The historic recipes are reproduced with dedication and passion. Natural and carefully selected ingredients, herbal extracts and fine essential oils provide a guarantee of the attention to quality that has accompanied the firm throughout its history and is still rigorously pursued to this day.